February sales at Toyota of Watertown will be down about 10 percent year over year because of the snow. Massachusetts dealer Scott Dube expects his sales to plunge by nearly a quarter this month after snow pummeled the state, leaving behind more than 100 inches in some regions. Dube had his sights set on a 115-unit sales month, but the snow’s effect will most likely make him settle for a 90-unit February. “It’s done a number on our sales department,” Dube, dealer principal at Bill Dube Hyundai in Wilmington, Mass., said. 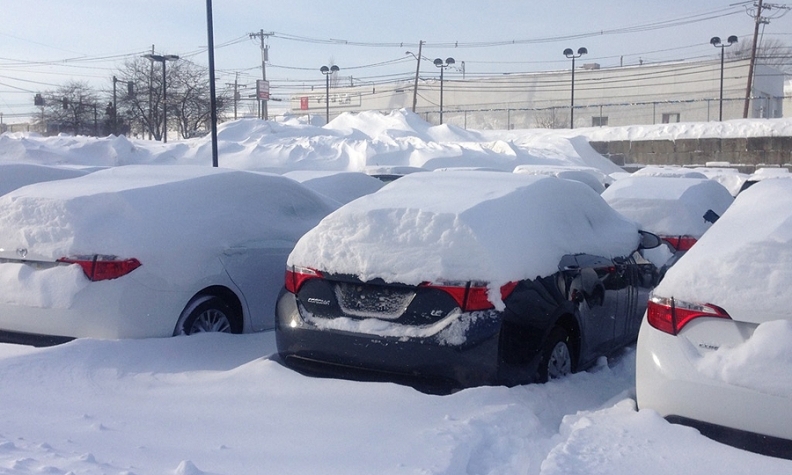 As Massachusetts recovers from all the snow, many dealers there are reporting weaker-than-expected February sales, operational losses and lack of space because of massive snow piles. New England missed out on an otherwise robust month. National sales are on pace for the strongest February since 2002 and the 12th consecutive month of year-over-year growth. Dube’s dealership has lost almost six days to the snow. “We were closed at least two days and essentially shut down another four days between employees not being able to get to work or doing snow removal at work,” he said. The Boston area has surpassed 100 inches of snow so far this season, according to the National Weather Service, making this winter the second snowiest on record. From Jan. 24 to Feb. 22, just 29 days, Boston saw 94.4 inches of snow, beating the previous record of 58.8 inches in January and February 1978 by nearly 3 feet. Robert O’Koniewski, executive vice president of the Massachusetts State Automobile Dealers Association, said that on average dealers have lost at least 50 percent of sales this month. “It’s impacted adversely what the dealers were counting on,” especially during Presidents Day weekend, he said. Many dealerships have extended Presidents Day discounts through early March to make up for lost business, spending advertising dollars twice to appeal to the same customer, O’Koniewski said. Adam Skolnick, general manager at Toyota of Watertown in Watertown, Mass., said he is eagerly waiting for March. February sales at Toyota of Watertown will be down about 10 percent year over year because of the snow, Skolnick estimated. He expected that sales would be up 10 percent. But with the snow came a storm of other problems. Chris Lemley, president of Sentry Auto Group, which operates two Boston-area dealerships, said his stores had a strong weekend Feb. 20-21, when he got a break from the constant blizzards. “The three weekends before that were just brutal,” said Lemley, whose group owns Sentry Ford-Lincoln in Medford and Sentry West Lincoln-Mazda in Shrewsbury. “Every time it snows like that we’re moving 300 cars, clearing them off, plowing and moving them back, he said. “I’d never seen anything like either the frequency or volume” of snow. Vehicles at Bill Dube Hyundai are gridlocked since the snow has taken up so much space in the lot. Dube said his service department loses three to four days of business after a snowstorm. The department’s revenue is down by about 50 percent this month. Customers haven’t been showing up for appointments, and service managers have had to spend chunks of time clearing out the snow. “It’s been devastating,” Dube said. Kelly Automotive Group, which has nine dealerships throughout Massachusetts, has spent more than $150,000 in snow removal at all its stores, Brian Heney, the group’s director of operations, said. Each of the group’s stores has a front-end loader, snowplows and an abundance of shovels to help deal with the snow. Kelly Automotive Group has also had to clear snow from the roofs of its dealerships. At its Nissan dealership in Beverly, Mass., the roof began to sag under the weight of the snow, so the group took preventive measures and cleared the snow off the roofs of a number of its other stores. “It’s hard work, and everyone’s doing it just so we can get the stores open,” Heney said. At several of the stores, employees worked in shifts overnight to clear the lots, he added. Even with the incessant snow, Heney said, sales have not suffered too significantly. He wouldn’t provide specific sales figures but said that the first string of storms in late January “definitely hurt our close of the month in January.” Up until the first major snowstorm hit at the end of January, Boston hadn’t seen much snow, so business was strong through the first part of the month, and that helped balance out the slowdown at the end of the month. “We had a big enough first half of the month where the numbers at the end of the month weren’t off drastically,” Heney said of January. He added that sales have continued to rebound in February and have been helped by promotions the dealerships have been running around Presidents Day. “It’s been tiring for every employee, but the business is still up there,” Heney said, adding that during the snow emergencies that forced the dealerships to close, the group still paid its nearly 500 employees. Still, not all dealerships shut down during the worst of the snowstorms. Ernie Boch Jr., CEO of Boch Automotive Dealerships, said his group’s dealerships did not close during the storm. Boch also handles distribution for all Subaru dealerships in New England. Boch said sales at his retail stores have been mixed, and while his Subaru distribution business has been up about 7 percent this month over the same period last year, his goal was to increase sales by 20 percent. Woburn Toyota in Woburn, Mass., stayed open every day it could, only shutting down for a one-day government mandate, and it’s paid off, general manager Ernest Sims said. “We’re way up from last February,” he said. Sims expects that the dealership will sell 240 to 250 vehicles by the end of the month, compared with only 160 units in February 2014. Last week John Marino, general manager at Prime Honda in West Roxbury, Mass., thought sales would be down 30 percent for the month. This week, Prime Honda’s sales have turned around. “It will probably be closer to 10 or 15 percent at this point,” he said. While the snow certainly has taken its toll, dealers across Massachusetts are already counting down to spring as Daylights Savings Time begins March 8 and the first official day of spring is March 20. Bradford Wernle and Joseph Lichterman contributed to this report.